Well, I was on a roll and all of a sudden fell right off of it. I missed a post yesterday so today you are going to get two of them. I know! I know! It's just not the same but I just feel the need. I've been busy creating and prepping for a class I was to hold today but due to circumstances beyond my control, it was canceled. One good thing that will come out of it, is that everything is ready for when it is scheduled again. 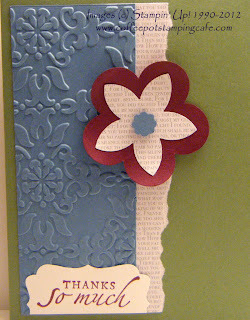 It's an All Occasions Card Class and this is the thank you card. It's a spin off of one I did at one of my local demonstrator meetings. Interested in making cards for your friends and family? Here are a few options for you to consider. You can host a Workshop or attend one of the several classes I offer throughout the year. For more information, click the Stamping Cafe Events tab at the top of this page.